September 1st marks the official start of the 2016 NCAA Cross Country season. If you follow any of the schools on social media, you would have seen many pictures and posts about their pre-season training sessions and their excitement for the upcoming season. They have good reasons to be excited. The USTFCCCA National Coaches Poll and Regional Rankings were released earlier this week. Let’s just say that there are high expectations on our Heps harriers. Five squads have official top-30 rankings in the National Coaches Poll (men | women), while another four squads have received votes which show they are on the national radar. The Penn men are the only men officially ranked in the top 30, coming in at #28. They hope to continue the momentum they started last year when they qualified as a team to the NCAA National Championships for the first time since 1975. 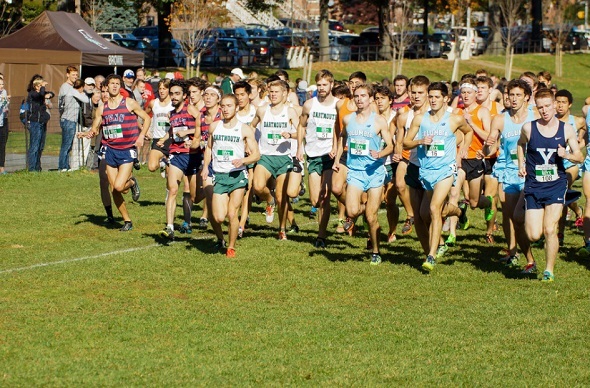 The defending HepsXC champions Columbia (#36) and Princeton (#38) were in the “receiving votes” category. The Princeton women – the defending HepsXC champions – are the top ranked Heps women in the national poll with a #23 ranking. Close behind them are Penn (#24) and Harvard (#25), while Yale also made the top 30 with their #29 ranking. Columbia (#37) and Brown (#39) are also receiving votes. The Ivy League joins the ACC, Big Ten, and Pac-12 conference by having four squads ranked in the top 30 in this poll. When you take into account the schools that are receiving votes, both the Ivy League, Big 12, and Pac-12 conferences have a total of 6 squads for the most in the nation. All of the schools fall within the top 10 of their regions (men | women). Penn is the top Heps school in the Mid-Atlantic region (#2 men; #3 women) with Princeton one slot back (#3 men; #4 women). The Columbia men have the highest ranking in the Northeast (#4), followed by Yale (#5), Cornell (#6), Dartmouth (#7), Brown (#8), and Harvard (#9). Meanwhile, Yale leads the Ivy women with their #3 ranking, while Harvard (#4), Columbia (#5), Brown (#6), Cornell (#7), and Dartmouth (#10) are not too far behind. Flotrack also released their own national rankings over the last few weeks, assessing the returning team members and potential impacts from their rookies or transfer students. None of the men made their poll, but the Harvard women was given a #13 ranking while Princeton women came in at #16. Another Flotrack pre-season ranking goes to Princeton’s Megan Curham, who is back and will compete this season, and Brown’s Natalie Schudrowitz. Curham comes in as #12 while Schudrowitz is ranked #21 in the pre-season women’s individual rankings. Do you agree with these rankings? Well, you may need to analyze their rosters if you want to understand where these numbers came from. Check out the 2016 roster links below if you wish. In the end, it’s just the preseason. Things will change as the season progresses. After all, isn’t that why we let them compete? This entry was posted on Wednesday, August 31st, 2016 at 9:32 am. It is filed under Athletes, Spotlight. You can follow any responses to this entry through the RSS 2.0 feed.